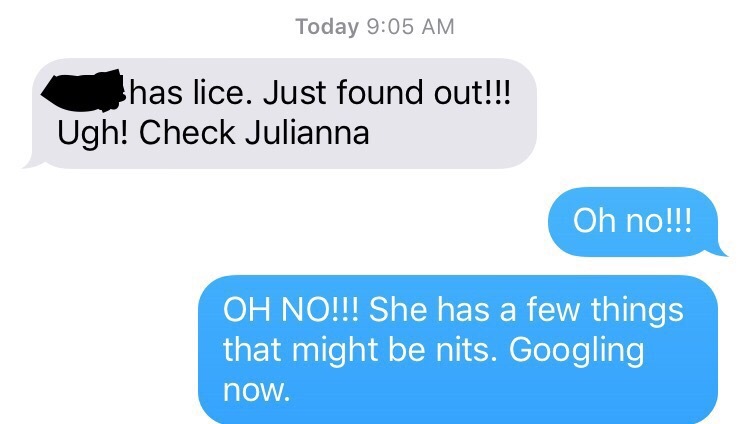 The text was from Julianna’s best friend’s mother (and a dear friend of mine), and sure enough, Julianna had lice. At first I thought I saw a few nits but I wasn’t certain so I was Googling madly. Then I called the pediatrician’s 24 hour on-call nurse to see what our pediatrician recommends and while I was on the phone with her, I found a live louse crawling on Julianna’s head. Thankfully, it appears that only Julianna had been infested. I checked Elizabeth and Mike carefully, and they checked me, and then I had one of my cousins at the graduation party check me this afternoon. No signs of lice on us. Phew! But we’ve been doing a lot of laundry, and of course Julianna’s head has been subjected to various concoctions both doctor-recommended (Nix) and of the local neighborhood folklore kind (at the moment she is sleeping with a head covered in mayonnaise and a shower cap). Most importantly, she’s been combed through fully with a lice comb twice now. So this week will be a combination of final packing madness plus more rounds of lice treatment and combing. Good times! The good news, however, is that in almost 13 years of parenting, this is the first time we’ve been struck with the lice curse. All things considered, I think we’ve been pretty lucky. More good news is that Julianna was a trooper through the whole thing. She cheerfully put up with all of the treatments and even the combing. I was impressed with her maturity and ability to go-with-the-flow, even through hours of lice-combing. Flat iron her hair on the highest setting. Worked like a charm for us several years ago.